Download our full CFPB Database Report (PDF). Consumers with complaints about their dealings with financial services companies have a federal watchdog—the Consumer Financial Protection Bureau (CFPB)—to assist them in reporting and resolving problems. More than 600,000 complaints have been logged in the CFPB database in the last five years. Consumers report unresolved disputes about mortgages, credit reports, student loans, car loans, bank accounts, debt collection, credit, debit and prepaid cards, payday loans, money transfers and more. Topping the list are consumers’ troubles with debt collection, credit reporting and mortgages/foreclosures. The CFPB offers the only public government complaint database with such a range of information, along with a complaint process that offers consumers a better chance at having companies address their complaints than other federal offices (although with no guarantee of resolution). Consumer Action studied the CFPB Consumer Complaint Database to evaluate its usefulness to consumers and to learn what we could about how consumers are getting their complaints resolved. (Our research is presented in a report available online.) We worked with Josue Chavez, an intern from Columbia University, to analyze the types of financial complaints consumers are reporting, learn how to access the information in the database and, where possible, discover the outcomes of the complaints. We’ve learned that sometimes progress is made on behalf of all American consumers, when, for example, a CFPB suit is filed against a company for unfair business practices or a harmful practice is banned through new rules, even when there is no individual success in the form of a refund or other remedy. Despite the range of data presented by the CFPB in its complaint database, however, sometimes there’s just not enough information provided for the public to judge whether progress has been made at all. Consumers who choose to include their firsthand accounts of their disputes with financial services companies in the public database will be helping alert others to the problems they’ve experienced and allowing the public to understand the reason they sought help. Complaint details from consumers who voluntarily share their stories (“opt in”) were added to the database in July 2015. Prior to posting individual complaint narratives, the Bureau removes personal information from each complaint to maintain complainants’ privacy. It screens each narrative and redacts any identifying details that might link the complaint to a particular person. Consumers can turn to the complaint database before making an important financial decision to learn of the types of problems people have had with a business and if there appears to be a pattern of similar complaints. The public database empowers consumers to make informed decisions about doing business with large financial services providers. They can also turn to the database after they’ve done business with a company, if they are dissatisfied, to learn from complaint data if others have had similar problems and if they were resolved. People who’ve experienced a problem can also report it to the CFPB (which forwards the complaint to the company) and publicly warn others to help prevent similar complaints in the future. While the CFPB complaint database includes all mortgage, payday loan and private student loan complaints, it only reports complaints about large banks and other financial institutions with assets of more than $10 billion. So small, local banks and credit unions will not make the list. That’s true for other small companies, too. For debt collection, credit reporting, auto financing and money transfer firms, only complaints about companies with the largest market share, called “larger participants,” are included in the database. misdirected (“incorrect company” listed in the complaint, according to the business). Note: Some complaints are not filed under company names consumers would recognize. This applies mostly to complaints about prepaid cards and specialty credit bureaus. These complaints are listed instead under the parent company’s name. So if you have a complaint about a Rush prepaid card, for example, it would be listed under the parent company Empowerment Ventures. The CFPB is considering revising this practice to make it easier to identify complaints by common company names when it updates its computer system next year. In “Complaint data doesn’t always tell whole story” (and in Part Two of the report), we review six complaint categories (student loans, credit reporting, mortgages, debt collection, bank accounts and services, and credit cards) and explain more about the details that many consumers voluntarily provide when filing a complaint. We also examine the limited information available about company responses and resolutions to these complaints (see "Holes in responses"), and explain what you can and cannot expect when you file a complaint with the Bureau. In "Double help for federal student loan complaints," we share some tips on how to get the best results when filing a student loan complaint. “Improving a valuable consumer resource” includes our findings and recommendations to the Bureau to improve this first-rate resource. For even more details, see Part Three of the accompanying report. Though the CFPB’s complaint database had been active since 2012, details of the complaints presented in a consumer’s own words weren’t available to outsiders until last summer. In mid-2015, the Consumer Financial Protection Bureau (CFPB) began allowing consumers to post a “narrative” of their complaints in the agency’s online public complaint database. Complaint narratives—combined with the company’s response and any relief provided—have the potential to reveal a lot about individual businesses as well as entire categories of financial product/service providers. In fact, the CFPB uses the extensive complaint data it collects to identify business practices that may pose a risk to consumers, enforce federal consumer protection laws and develop better regulations. However, a review of a sampling of complaints finds that the data is not always as revealing as it could be for individuals trying to make wise financial choices. Consumer Action and fellow consumer advocates had fought for years for the inclusion of complaint details in the database because the narratives reveal a more vivid picture of the problem than generalized categories can, and allow the public to draw its own conclusions about the complaint and the company’s response (or lack of one). Fifty-nine percent of consumers who filed complaints with the CFPB in 2015 chose to share details with the public. It’s often difficult to understand why certain text is removed, but the Bureau appears to use a “better safe than sorry” approach. Consumers should note that while the database provides the total number of complaints against a particular company, it does not account for the size of the company. Without comparative size information, an outsider using the database can’t fully judge a company’s performance relative to its competitors. For example, if Company A has 100 complaints listed and Company B has 300 complaints, a consumer could draw the conclusion that Company B has many more dissatisfied customers. But what if Company B has five times as many customers as Company A? Indicating the number of complaints per, say, 1,000 customers, would give more meaning to the data. The company named in the complaint is expected by the CFPB to answer the complaint within 15 days and resolve the complaint within 60 days, and must categorize its response as Closed with Monetary Relief, Closed with Non-monetary Relief, Closed with Explanation, Closed, In Progress (company needs more time to investigate complaint) or Administrative Response (for example, the account was sold or fraud is suspected). The vast majority of complaints (68% to 89%) were labeled “Closed with explanation,” but that doesn’t explain much. According to the CFPB, explanations may include things like telling consumers that their credit line increase or loan application was denied because they don’t have sufficient income to qualify. Individual consumers may have received detailed explanations, but the public sees only “Closed with explanation,” which doesn’t give the user enough information to reasonably judge a company’s response. The database does note when consumers dispute a company’s response, but provides no details on why they still were dissatisfied. This was the case at the time of our research. However, a just-announced change of policy, effective in early 2017, will allow consumers to rate their satisfaction with a company’s response on a scale of one to five and explain their ratings. Consumers will have the choice to make their rating details public in the database. The new satisfaction rating scale should make it easier for consumers to respond and evaluate how well companies handle their complaints. The CFPB complaint database is an invaluable tool for the agency, which is able to analyze all the complaint data it gathers, including what is not revealed to the public, to identify marketplace misbehavior and opportunities for improved regulation. For example, in early 2015, the CFPB took action against three mortgage lenders for deceptive advertising, which was brought to the agency’s attention in part by consumer complaints. Consumer complaints also helped regulators direct $80 million in restitution to minority borrowers who were unfairly overcharged on their auto loans. Despite the public details being less robust than desired, the database is a valuable tool for individual consumers, outside agencies and the press, who can use it to gain insight into consumers’ issues and the ways companies respond to them. Consumers who voluntarily share their complaint narratives help their peers make wise financial choices and avoid problems. Companies that resolve consumer complaints can respond with “Closed with monetary relief” or “Closed with non-monetary relief.” Monetary relief is a specific dollar amount returned to the consumer, such as crediting an overdraft or late fee or refunding a finance charge. Non-monetary relief could include remedies such as correcting a credit report error or ceasing debt collection calls. In 2015, companies provided monetary relief in response to more than 9,700 complaints. Complaints with the highest percentage of monetary relief were prepaid cards (24%), credit cards (19%) and bank account or services (18%). Median amounts of relief for these three categories were $371, $100 and $105 respectively. Mortgage complaints received the highest median amount of relief ($500), yet a mere 3 percent of mortgage complaints received any financial compensation. Consumer Action has worked to encourage the CFPB to make its public complaint database as useful, transparent and powerful as possible. Over the last five years, the Bureau has expanded the database’s functions and the information in it that the public can access. The complaint database is an important tool for consumers to evaluate a business and alert others to problems. But we believe there is more work to be done to make this first-rate resource even more helpful to consumers. Consumer Action’s review of the CFPB complaint database found it to be “clunky” for consumers to use and uninviting to look at. When filtering data in a search, often no results appear; the filter is sensitive to spacing discrepancies and sometimes difficult to use. We often had to restart our search, which wastes time and has the potential to frustrate users. Information about complaints is voluminous but detail about outcomes is sparse. Most of the very limited information on complaint resolutions was found in the CFPB’s annual complaint report. Even in the report we find the details to be insufficient. It’s not easy to learn what solutions have been forthcoming from certain companies and there are no explanations on why consumers go on to dispute company responses (now called providing “feedback”). Fortunately, this will change for the better when the Bureau institutes its upcoming rating system to allow consumers to explain why they were satisfied or dissatisfied with a company’s response to their problem. While 97 percent of consumers received a response to their complaint from the companies they had a beef with, true complaint resolutions have been dismally low. As of January 2016, only 6 percent of complainants received monetary relief (the amounts vary widely by category—from prepaid cards with 24 percent monetary relief to mortgages with 3 percent) and 12 percent received non-monetary relief. Explanations sent by the company to the consumer accounted for 72 percent of responses. These might include why the company did not grant a credit line increase, why it rejected a loan application or how the bank’s overdraft process works. While these might be considered a form of resolution since they notify the consumer of the company’s reason behind its action (or inaction), there’s no way to judge how satisfied consumers are with companies’ explanations until the Bureau’s satisfaction rating scale is in place. Include all complaints received by the CFPB in the database (no exceptions) and list all complaints by the name of the company the consumer complained about (not only by the parent company’s name). Increase and improve information about consumer relief. Currently, there is no information in the database about the exact amount or type of relief provided to complainants and very few details are featured in the Bureau’s annual complaint report. We’d like to see the database include the dollar amounts of monetary relief granted and specific actions taken to provide non-monetary relief (for example, an error removed from credit reports). Provide explanations. In 2015, 72 percent of consumers received an explanation from the company in response to their complaint. Details from these explanations should be shared with the public. It would be useful for all of us to know the companies’ explanations for things like why a credit line increase wasn’t approved, why a loan was denied or how a particular company process works. Note third-party referrals. If a company responds to the consumer that a third party is responsible for his or her problem, the company should be compelled by the CFPB to provide the complainant with contact information for the third party so that the consumer can continue efforts to resolve the complaint. Improve functionality. 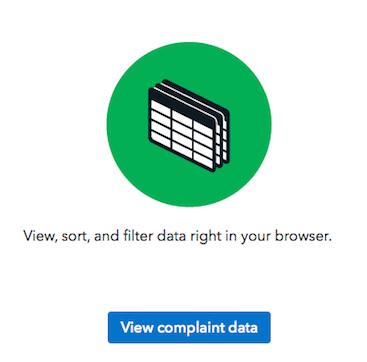 Make filtering the complaint data easier and quicker. Users should be directed to keep searches simple and to use the Narrative option to learn about consumers’ specific problems. Relax the scrubbing standard. We believe it would be possible to allow the public to view more of the content of the Narratives (details) while still protecting consumer privacy. This would allow viewers to better understand the substance of the complaints. Require response and resolution. Require all companies supervised by the CFPB to adequately respond and attempt to resolve consumer complaints. As it stands now, far too many consumers get non-responsive replies from companies. Provide consumer notification when further CFPB action (lawsuit, settlement, new rule) results from a complaint they submitted. The consumer should be notified directly by the Bureau in a timely manner, and the action should be reported to the public to expand awareness and use of the complaint tool. The complaints that consumers report to the CFPB on financial products and services run the gamut from interactions with student loan debt collectors to run-ins with financial scammers and fraudsters. The complaint database is broken down into 11 product categories: bank account or services, consumer loans, credit cards, credit reporting, debt collection, money transfers, mortgages, payday loans, prepaid cards, student loans and other financial services. Each category contains sub-products. For example, “bank account or services” complaints are classified as checking account, savings account, certificate of deposit (CD), check cashed without an account, or another activity. Once you understand how to find the information you need, you have a valuable tool at your disposal. So, how do you access the complaint database, and how do you best use it to learn more about the complaints and companies that most interest you? From the CFPB’s homepage, you can access the database by scrolling down to “Submit a complaint” (on left) and clicking on the “Browse public complaints about companies” link. Download options and API (mostly for those doing in-depth research/statistical analysis). When users click on the “Read consumer narratives” option, they are taken to a section of the database that lists only complaints with narratives (complaint details). This section also includes the company’s standardized response to the complaint, if they provide one. Consumers will find that both selections offer them the ability to view, sort and filter data right in their browser based on specific search criteria. Users can gather the data by such things as product, complaint type, company, state, date, or a combination of variables. Use the blue filter box on the right side of the screen (click the blue Filter button above the gray bar if the box doesn’t appear automatically) for more in-depth filtering. The easiest way to filter the data is by using the gray header bar’s filter functions. Use your mouse to click on the menu (the icon displaying three bulleted lines that appears when you place your cursor on the column name). A small dropdown menu will open, enabling you to sort by ascending or descending order or to filter by particular criteria (options differ for each column). For instance, to filter by product type, click on “Product” in the gray bar. When the dropdown menu pops up, click on “Filter This Column” and select from the 11 product categories (Mortgage, Credit reporting, Student loan, etc.). You can continue to click on the menu option in each column to further define your search. For example, you can add a sub-product, such as “Home equity loan or line of credit,” your state, a company’s name and/or select those that include the actual complaint submitted in the consumer’s own words (“narrative”). From there, you can narrow your search step by step. For example, you could search for (1) all debt collection complaints (2) received between 1/1/15 and 6/1/15 (3) from consumers in Nebraska (4) that are related to “debt is not mine” and that (5) include a narrative. 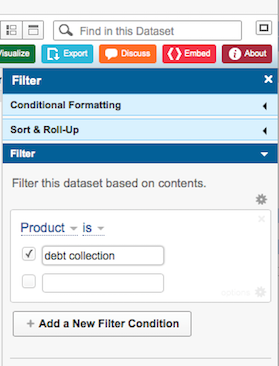 To target your search by complaint details and a particular company, click on “Add a New Filter Condition” and choose “Consumer complaint narrative.” Then set the filter to “contains” and enter the name of the company in the bar. When adding filter conditions in the sidebar, avoid using “is”; instead click on the tiny downward-pointing arrow and select the word “contains” for best results. This will prevent some results from being omitted because there wasn’t a perfect word match. To remove a filter from the gray bar, click on the small red “T” symbol at the top of the column. To start from scratch, click on the “Revert” button in the top left area, above the gray bar. Be aware, sometimes the database will fail to yield any results even if results exist. If this occurs you can click on the refresh arrow after resetting filters. Use “keywords” to target a search. For example, to find complaints about Chase Manhattan Bank, you can type the name into the search box (top right of page with magnifying glass labeled “Find in this Dataset”) and hit the Return key on your keyboard. Users conducting more advanced searches can save the results or export them to post on a website or to social media. The database allows all of this via additional colored buttons near the blue filter button. Users can create graphs and charts from the data as well, and even change the way the data is viewed. While working with data can sometimes be challenging, the ability to search and evaluate financial complaints through the CFPB’s public complaint database is invaluable. Editor's note: A more in-depth story about how to file a complaint with the Bureau can be found online at Web Bonus: How to file a complaint with the CFPB. The Consumer Financial Protection Bureau (CFPB) pays close attention to consumer complaints, but this aspect of the Bureau’s work is mostly under the public’s radar. The Bureau relies on consumer complaints to help guide its priorities and enforcement actions. File: You file a complaint (online, by phone or by snail mail). Forward: The CFPB forwards your complaint to the company. Blames a third party for the problem. Feedback: You can “dispute” the company’s response by writing or calling the CFPB to explain your dissatisfaction with how the company has handled your complaint. Neither the company nor the CFPB are likely to re-open the case, but the Bureau does want to hear your feedback. Soon you will be able to formally rate a company’s response. Outcome: On occasion, the CFPB will follow up on your complaint directly with the company and you may end up with a positive outcome. But more likely, they will collect your disputed complaint and look for troubling trends: Are there many other similar complaints? Is there a pattern of unfair or deceptive actions? Are there signs of discrimination? If so, the CFPB may open an investigation and, if warranted, start an enforcement action against the company. When your attempts to work with your student loan servicer leave you frustrated or feeling hopeless, where do you turn? Fortunately, borrowers have more than one avenue for help these days. Whether your student loan servicer is ignoring your pleas to correct errors on your account or makes sudden changes to the terms of your student loan, you can seek backup against some of the biggest banking-bullies in the industry. Both the consumer financial watchdog—the Consumer Financial Protection Bureau (CFPB)—and the U.S. Department of Education accept borrowers’ complaints and put a little muscle behind your attempts to resolve them. Typically the CFPB handles private student loan complaints and the Department of Education handles federal student loan complaints. The Education Department has a new complaint system designed to resolve problems with federal student loan balances, loan servicers, debt collectors, and schools’ financial aid offices. How to know if you have a private or federal student loan? It can be tough to spot the differences between federal loans and private loans because the same lenders are often involved and schools sometimes put their names on private loans. Visit the Student Loan Borrower Assistance website for advice on figuring out which category your student loan falls into. But Consumer Action believes it’s worth your while to submit federal student loan complaints to both the CFPB and the Department of Education for expedited attention. Private student loan complaints should continue to go to the CFPB. In late July, the Consumer Financial Protection Bureau announced plans to give consumers the option to rate and provide feedback on a company’s response to and handling of complaints they file at the Bureau. You can comment on the plan at the Federal Register website. The comment deadline is Sept. 30. The plan would allow consumers to rate a company’s handling of their complaint on a one-to-five scale and provide a written explanation of why they were satisfied or dissatisfied with a company’s response. Consumer feedback will be shared with the company to inform its complaint handling and used to inform the Bureau’s work to supervise companies and monitor and improve the market for consumer financial products and services. Since the Consumer Financial Protection Bureau (CFPB) opened for business in 2011, it’s handled nearly one million complaints about mortgages, credit cards, student loans, auto and consumer loans, bank accounts, debt collection, payday loans, prepaid cards, money transfers, credit reporting and a handful of “other financial services” (for example, debt settlement and check cashing services). Its enforcement activity has resulted in more than $11.7 billion in relief for more than 27 million consumers. Yet many consumers are still unaware that the agency exists or how it can help them get responses from their financial service providers when troubling issues arise. The CFPB states that its purpose in collecting and managing consumers’ complaints about financial products and services is to learn more about harmful business practices that “pose a risk to consumers.” The more complaints the CFPB receives about the same issue or financial product, the more likely a larger problem exists that regulation might help resolve. By submitting your complaint to the CFPB, you are not only empowering yourself to address your financial woes, but you’re also helping other consumers avoid problems. Consumers can log complaints about a host of different issues, including billing, advertising, fees, interest rates, loan servicing and debt collection practices. You can file a complaint on behalf of yourself or someone else (say, your elderly aunt who is having trouble with her reverse mortgage). If you’re not comfortable using the website, you can submit a complaint by email, phone, fax or mail (contact details below). If you don’t want to submit a complaint, you can “tell your story” to the CFPB, which will not trigger the complaint process but may be used to inform CFPB investigations, enforcement efforts or public education campaigns. Your first step should be to contact the company you’re having problems with directly. Start with a phone call or email to customer service and give the company an opportunity to resolve your complaint. If your first email or call doesn’t take care of the issue, call again and ask to speak to a manager, who may have more authority to resolve your complaint. Document your attempts to solve the problem by keeping good notes, including the dates and times of calls and correspondence, names of representatives you spoke with and what was discussed. If your attempts to resolve your issue directly with the company fail, then it’s time to contact the CFPB. Then choose the appropriate category of complaint and the best description among those offered (for example, “harassing communications” or problems with “making payments”). Then you will have the opportunity to write what you think would be a fair resolution to the problem. Keep it short and to the point. Finally, you’ll be asked to submit your first and last name, mailing address and email address. At this point you have the option to provide your account numbers and to attach any documents that support your complaint, such as proof of payment or correspondence from the company. You’ll be able to review your complaint before submitting. A live-chat function will connect you with a CFPB representative if you have questions during the complaint submission process (chat is available weekdays from 8 a.m.-8 p.m. ET). Your complaint is forwarded directly to the company you named. The company will review your complaint and reply directly to you. It has 15 days to provide an initial response and up to 60 days to resolve (and close) the complaint. Companies copy the CFPB on their responses. If you are displeased with the company’s response, you have 30 days to notify the CFPB. The company won’t review the complaint again, but your case might be referred to another CFPB division for further investigation. Starting in 2017, consumers will have the option to use a satisfaction rating scale—one to five stars—and provide feedback on why they are satisfied or dissatisfied with a company’s response. Throughout the process, you’ll be able to check the status of your complaint by logging in at the CFPB’s website or by calling the toll-free number. The CFPB handles complaints about large banks and credit unions. The Bureau also supervises nonbank mortgage originators and servicers, payday lenders and private student lenders of all sizes, as well as larger companies from other financial markets, such as consumer reporting, debt collection, student loan servicing, international money transfers and automobile financing. If the financial institution you’re having a problem with is not regulated by the CFPB, your complaint will be forwarded to the correct agency and you will be notified. Download the CFPB’s Monthly Complaint Reports to learn what consumers are complaining about. Consumer education. To empower consumers to assert their rights in the marketplace, Consumer Action provides a range of educational resources. The organization’s extensive library of free publications offers in-depth information on many topics related to personal money management, housing, insurance and privacy, while its hotline provides non-legal advice and referrals. At Consumer-Action.org, visitors have instant access to important consumer news, downloadable materials, an online “help desk,” the Take Action advocacy database and nine topic-specific subsites. Consumer Action also publishes unbiased surveys of financial and consumer services that expose excessive prices and anti-consumer practices to help consumers make informed buying choices and elicit change from big business.